Every size Rage competition kettlebell from 4kg to 48kg. Includes 1 each of 4, 8, 12, 16, 20, 24, 28, 32, 36, 40, 44, 48 kg. Competition kettlebells are useful even for non-competitors. They are constructed to all be the same diameter, regardless of weight. The only difference is the size of the cavity in the body of the bell to calibrate the weight. This gives the bell a uniform outer size, even across different brands, so you're used to using the same height and width kettlebell no matter how much weight you're using. This consistent size keeps your form consistent. The size effects how the kettlebell lands on your wrist and forearm. The more consistent your movement, the better you will perform the workout. 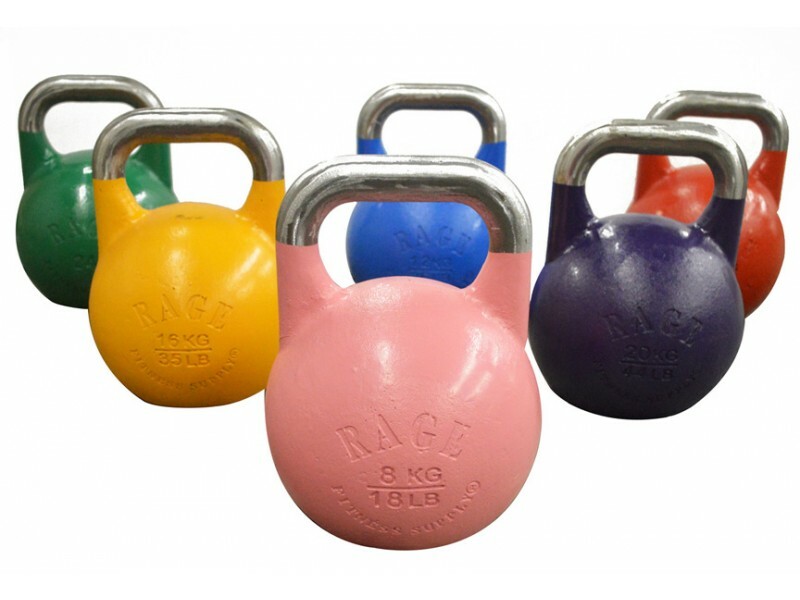 Note that Rage's kettlebells typically have some mars or scratches on the body of the bell, but nothing that will impair its use. The handle will be fine, which is important for smooth movements without tearing up your hands.